On November 9, 1989, nearly 25 years ago, the Berlin Wall was brought down by the people trapped behind it for decades. In the following months, city authorities took down slabs of the Wall to reconnect streets, parks, and subways. Berliners and tourists hammered away pieces of the Wall for keepsakes. Soon, the Wall was gone. Or was it? Not only is it not gone, there are new remainders of the Wall every year: Wall slabs in front of Berlin hotels, churches, and museums, steles and signs, and the ever-growing cobble stone path tracing the Wall. The Wall Memorial Museum at Bernauer Strasse has a new outdoor exhibit, including a chapel where the Church of Reconciliation had been. There is even a whole new museum devoted to the Wall, the Palace of Tears, located at the Friedrichstrasse train station. 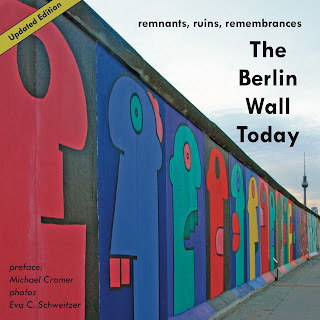 And there are other places in Berlin where you can still see parts of the Wall, or remainders, such as watch towers, artwork, or memorials: The Berlin Wall Park, the Bernauer Strasse Memorial Museum, the Veteran's Cemetery, the area around the Reichstag and Potsdamer Platz, Checkpoint Charlie, the Topography of Terror Museum, the Museum of Forbidden Art, and the East Side Gallery. You can find all these places and more in our full-color picture book The Berlin Wall Today. Ruins, Remnants, Remembrances, by Michael Cramer. The book is now out as a newly updated fall 2015 edition with more pages, more pictures, more maps, and more Wall remainders. In the weeks towards the anniversary, we will show you a collection of those pictures on Facebook and on our blog.